Sebastian Pinera: "(The people) have opted for change, for the future, for hope." 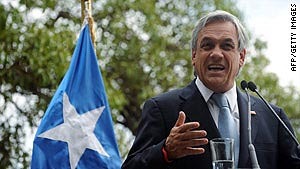 (CNN) -- A day after winning Chile's runoff election for president by a narrow margin, conservative businessman Sebastian Pinera congratulated his countrymen and vowed to carry out their mandate for change. "Yesterday, I felt very proud of our democracy and very proud of being Chilean," the president-elect told more than 100 supporters in the town of Puente Alto just south of the capital. His victory came with 51.6 percent of the vote versus 48.4 percent for Sen. Eduardo Frei, a former president. "The people expressed themselves in strong and clear form," he said, according to his press office. "They have opted for change, for the future, for hope." Despite its close result, the election's outcome was clear by 6 p.m. -- Pinera had defeated Frei, who served as center-left president from 1994 to 2000. Frei had returned to politics as a Christian Democrat senator and campaigned on continuing the policies of the current president, Michelle Bachelet. Pinera, 60, met Monday morning with Bachelet. He also fielded congratulatory calls from leaders around the world, including French President Nicolas Sarkozy, Spanish President Jose Luis Rodriguez Zapatero, Colombian President Alvaro Uribe, Bolivian President Evo Morales and Peruvian President Alan Garcia, said Gustavo Manen, CNN Chile's political editor. Bachelet, who was constitutionally barred from running for re-election, leaves office in March. She has garnered high approval ratings for steering the country through the global economic downturn, and promoting progressive social reforms. "We are going to govern until March 11 without rest, along the same path of progress, social protection and justice for our country," she said in a posting on the president's Web site. She vowed to hand over a country "healthy, with consolidated institutions, with a growing economy and with a system of social protection that takes care of those who need it most." "This is today a much better country than 20 years ago. It is a country that has advanced in greater liberties, greater rights, justice and progress for its inhabitants," she added. Bachelet had endorsed Frei, a member of her left-leaning Concertacion coalition. Pinera, a former senator, had sought the presidency since the 1990s, losing to Bachelet in 2005. His triumph in the runoff election marks the first time since the fall of the Augusto Pinochet dictatorship that a conservative has won at the polls. In the two decades since, all the presidents have come from the left-leaning coalition. Pinera is one of the country's wealthiest businessmen. He earned a doctorate in economics at Harvard and previously served as a senator and president of the National Renovation Party.